There appear to be three varieties of Eriogonum umbellatum actually present at SnGb, although there are vouchers with the names of four other varieties that are not listed as being present at SnGb in the Jepson Manual Second Edition treatment. This is probably due to the variability inherent in each of the varieties and the subtle distinctions between some of the varieties. This page ignores those four other varieties, and shows the distribution of the three varieties actually present at SnGb, all from vouchers. The three varieties present in SnGb and their key characteristics are given in Table 1. The column with header #V gives the number of RSA / POM vouchers with those determinations. I restrict it to RSA / POM vouchers since they have all been recently reviewed by Orlando Mistretta. In Table 1, characteristics unique to one variety are given in bold. The infl branch order is whether there is a single whorl of leaf-like bracts at the base of the entire inflorescence, or whether there are two whorls of bracts, one at the base of the entire inflorescence, and another at the base of clusters of heads at the end of the infl. This is shown in Fig. 1. Fig. 1. Left: Infl branch order 1, with only a single whorl of leaf-like bracts. Right: Infl branch order 2, showing the existence of at least one additional whorl of leaf-like bracts above the lowest whorl of bracts. Infl branch order 1: pix 1; pix 2. In this type of inflorescence, the heads branch from a single common point. Infl branch order 2: pix 3; the infl branches at the top middle right in this pix show the secondary whorl of bracts most clearly. In this type of inflorescence, some heads branch from a second common point above the base of the inflorescence. var. umbellatum, which isn't in California. Again, this plethora of vouchers determined as a variety whose range does not include SnGb is probably due to the variability inherent in each of the varieties and the subtle distinctions between some of the varieties. It is quite possible that some of these vouchers are in fact identical to vouchers of plants of that variety from its true geographic range. 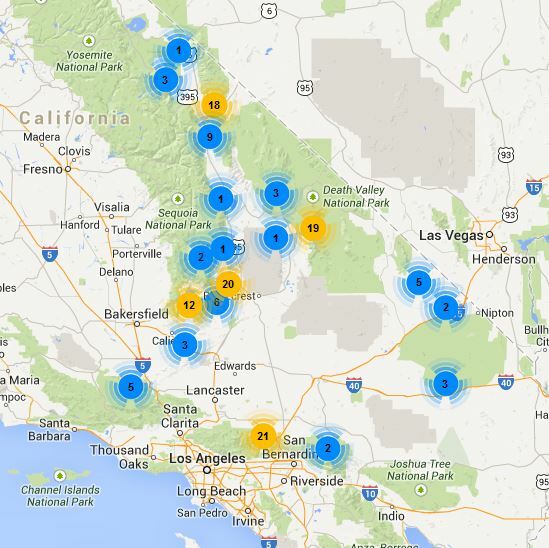 The geographic distribution of all georeferenced Eriogonum umbellatum vouchers at SnGb is shown in Fig. 2. Fig. 2. Geographic distribution of all georeferenced Eriogonum umbellatum vouchers at SnGb. The distribution of those identified to a variety, of the three considered to actually be at SnGb, is shown in Fig. 3. Fig. 3. Geographic distribution of all georeferenced Eriogonum umbellatum vouchers of the varieties at SnGb. 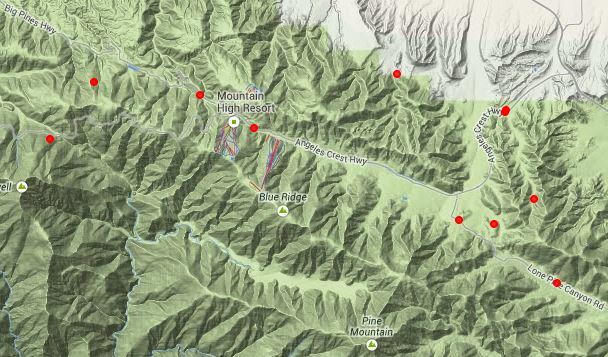 Variety minus is the only one found at elevations above ~7500 feet, with only a single voucher of var. munzii located above 7500 feet (which may or may not be correctly determined). All three varieties are found below 7500 feet. Fig. 4 shows the distribution of elevation vs. longitude. Fig. 4. Elevation vs. Longitude for all georeferenced Eriogonum umbellatum vouchers of the varieties at SnGb. Variety subaridum is mostly found north of SnGb (see its geographic distribution for all of California), and apparently barely sneaks into SnGb. 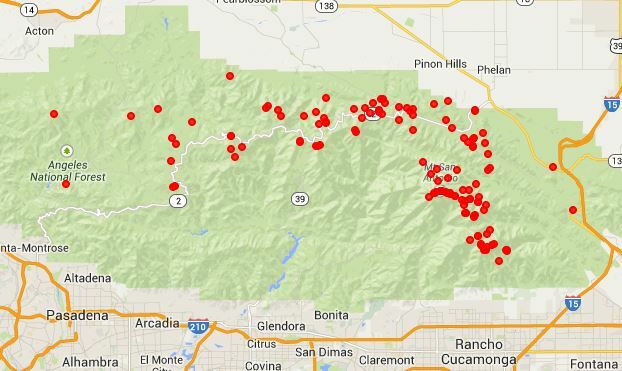 It is confined to the Wrightwood area of SnGb, as shown in Fig. 5. However, as shown in Fig. 3, it is outnumbered there by vouchers of var. munzii, so it is less than clear whether these plants are just one form of var. munzii. Fig. 5. Geographic distribution of Eriogonum umbellatum var. subaridum vouchers at SnGb. Voucher data provided by the participants of the Consortium of California Herbaria (ucjeps.berkeley.edu/consortium/). retrieved on 19 July 2014. Copyright © 2014 by Tom Chester.